Ring, best known for its popular video doorbells, has added an outdoor Floodlight Cam to its security camera product lineup. The Floodlight Cam is a motion-activated security camera with built-in 3K lumen LED floodlights, a 270-degree field-of-view, facial recognition, a 110-decibel siren alarm, two-way audio, and infrared for night vision. The hardwired, self-install camera is controlled via Wi-Fi with an iPhone or Android-based smartphone. When the Floodlight Cam detects movement, homeowners will receive a push notification on their iPhone, while the HD video camera will also begin recording so users can see and speak to whoever is on their property through the free Ring app for iPhone and iPad, Mac, Android, and Windows 10 devices. If a suspicious person is detected, homeowners can scare them off by turning on the device’s siren, yelling over the loudspeaker and pulsing the light rapidly. Not only will this likely scare off a potential intruder, but it will also get neighbors’ attention so they can assist in calling the authorities. Video recordings can be accessed during and after an event and shared with neighbors and local law enforcement. 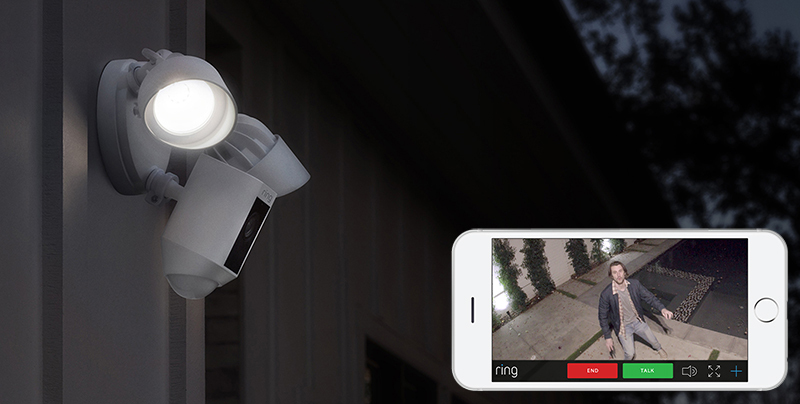 With the Ring app, homeowners can manually flash the floodlights, sound the alarm, and zoom in and pan to focus. Users can set customizable motion zones and a schedule for the lights to turn on and off automatically if desired. The camera is weatherproof and designed for temperatures between -5°F (-20°C) and 120°F (48°C). Ring is accepting pre-orders for the Floodlight Cam for $249 on its website beginning today; orders will begin shipping in early April. Cloud video recording, allowing users to view and download up to six months of previous events, is available for $3 per month or $30 per year if desired. Update: Ring has since confirmed on Twitter that its Floodlight Cam will support HomeKit. A media representative for the company confirmed HomeKit will be enabled in a future software update, but no timeline was specified. Not a fan of Ring's subscription-based issues. I chose Skybell over Ring because there's no subscription fee required to get more features or retrieve videos. I'm sure this will be roped right into that ecosystem as well. These types of products need to have local storage with the OPTION of cloud storage. Not their current method of no storage at all unless you pay us perpetually. That's what I was thinking. Other product releases are venturing on the Home Kit path. I think it's a huge downfall if they don't Bridge to Home Kit and it's expansions. The camera is weatherproof and designed for temperatures between -5°F (-20°C) and 120°F (48°C). Well, that pretty much rules out the northern half of the United States and parts of the southwest. I was really interested in this but it sometimes gets cold here. I wonder if it just shuts itself off or something if it gets too cold? Or does it just break? I have it on my list to install a floodlight in the back of my new house this spring. I've also been looking at surveillance solutions. This would be a great combo and I wouldn't have to run extra wires. I wish it had HomeKit to set up triggers. For instance, the floodlight would go down by my back door. I could set up a trigger to turn on the lights downstairs within 10 seconds of detecting someone. That makes them think someone woke up. Could also hook it up to a speaker that sounds like a large, angry dog. I'd just get a loud, angry dog, but we have an in-home daycare and that complicates things.